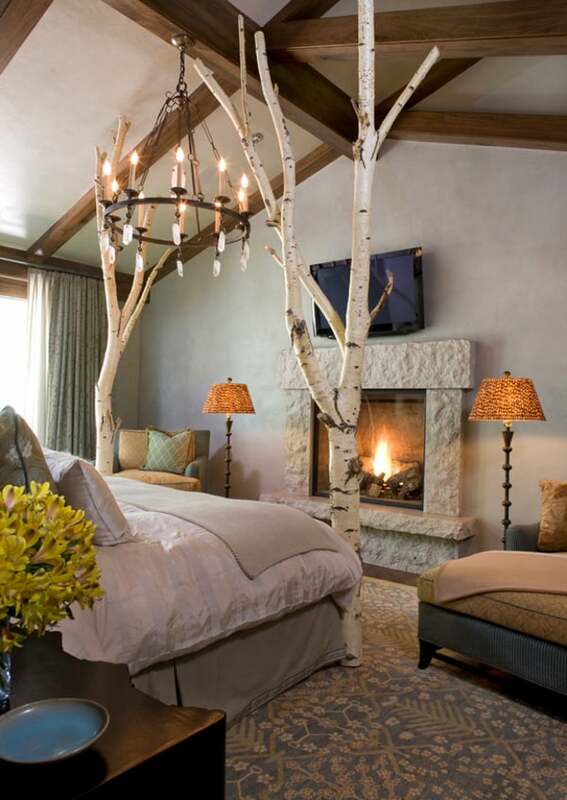 Create a glowing master bedroom retreat with the addition of a cozy fireplace design to keep you warm on cool winter nights. 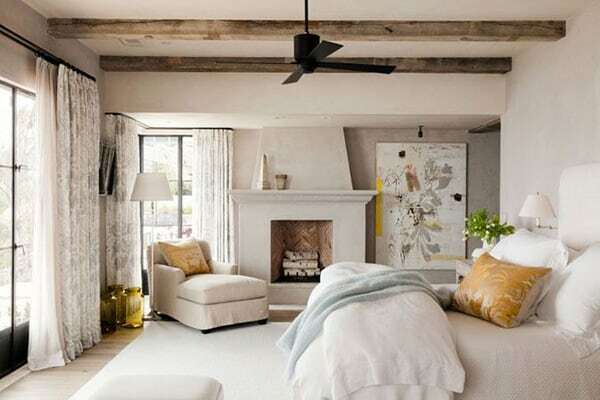 Last week we brought to you Clean and modern showcase fireplace designs and for today we have gathered together a collection of fireplace design ideas for your bedroom, with designs ranging from minimalist to rustic and traditional styles and everything in-between. 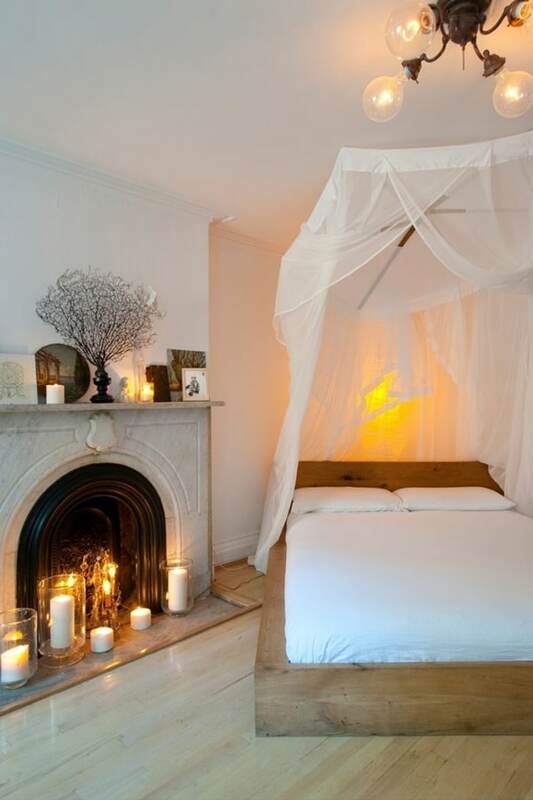 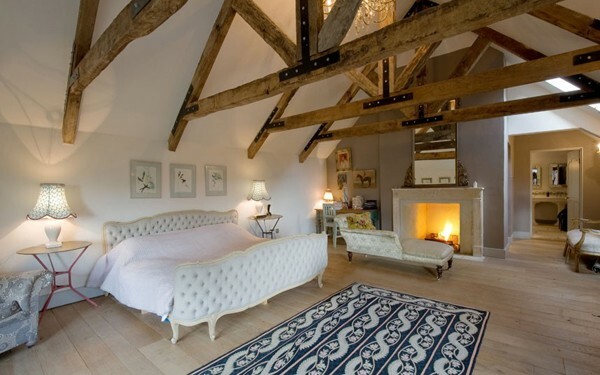 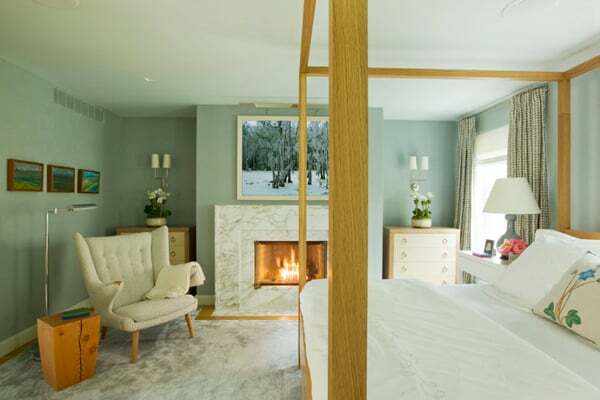 Incorporating a fireplace into your bedroom design scheme can be a great luxury and there are a variety of ways to bring your design into fruition. 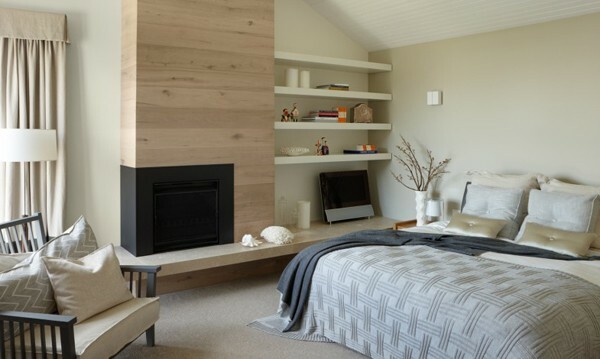 Fireplaces come in all shapes and sizes but how they are finished can make all the difference in how the room comes together and reflects your style. 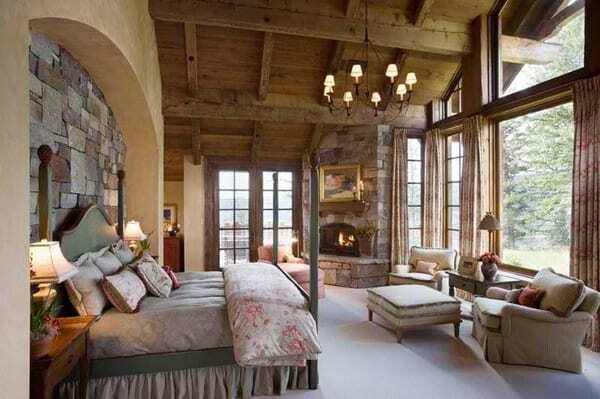 They can be the main focal point of a room and hold great grandeur and style. 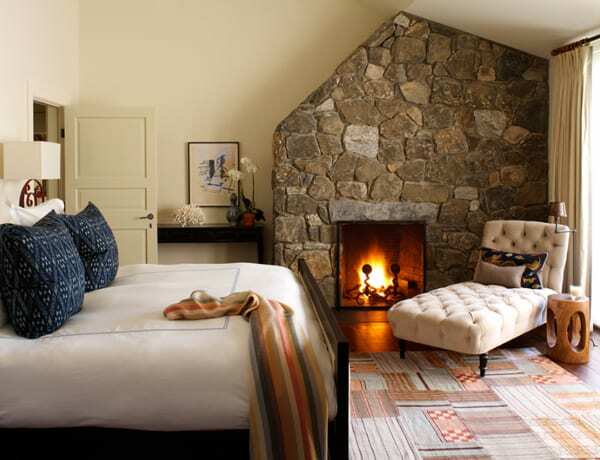 In addition to providing warmth, fireplaces these days have become a fashion statement. 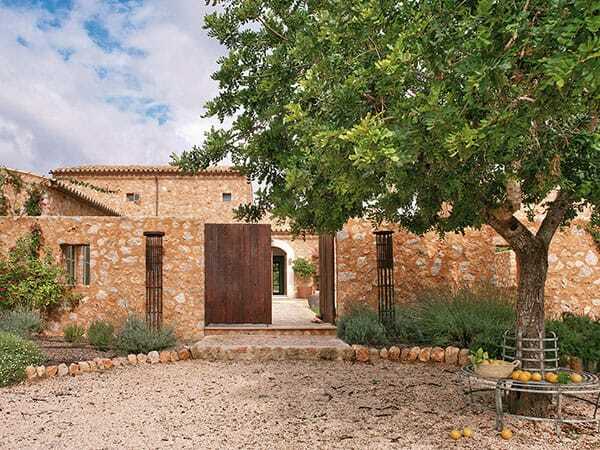 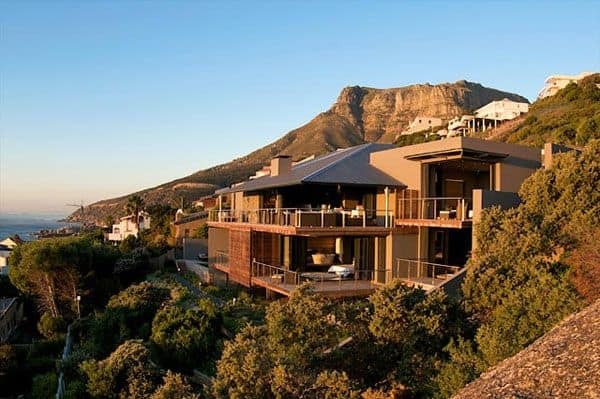 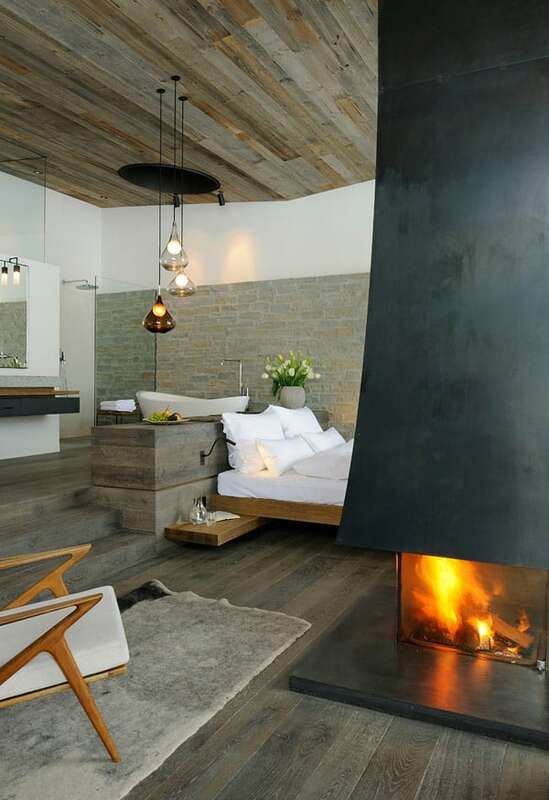 The emphasis is not merely just on functionality but more on form and expression. 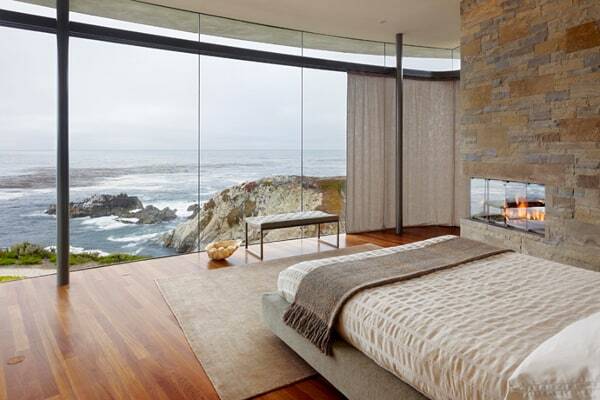 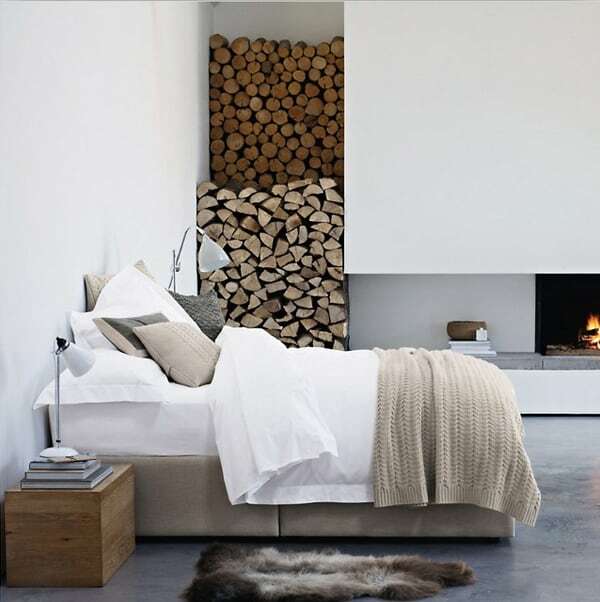 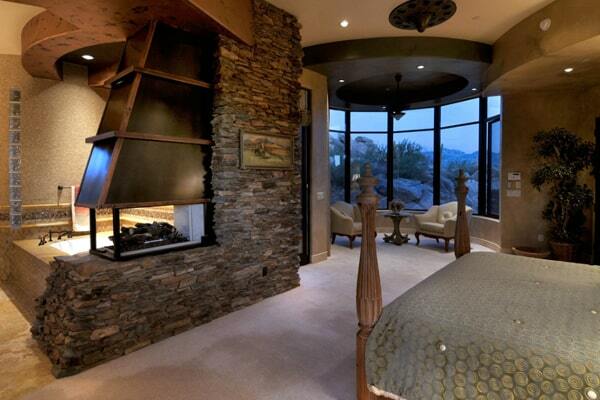 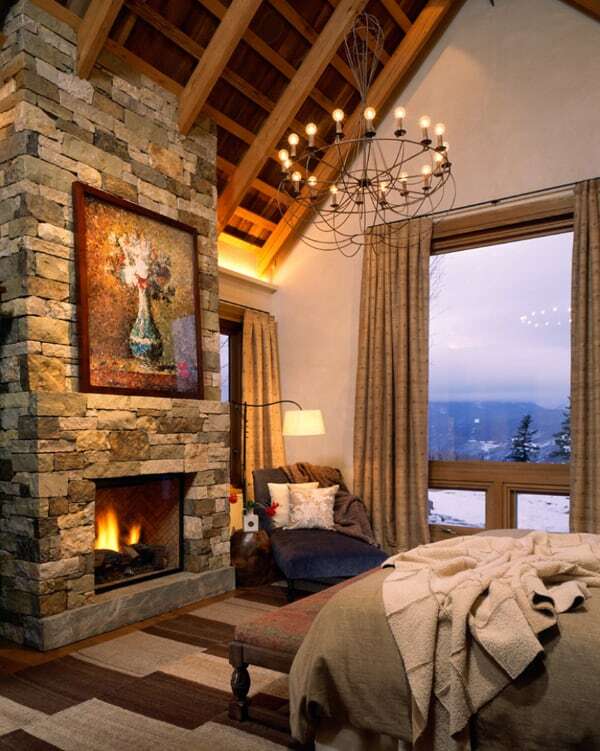 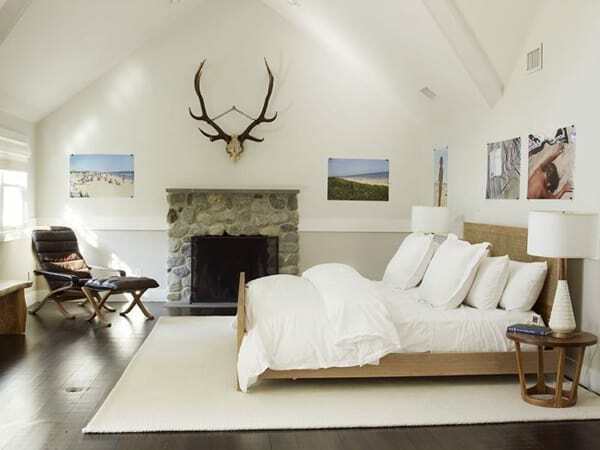 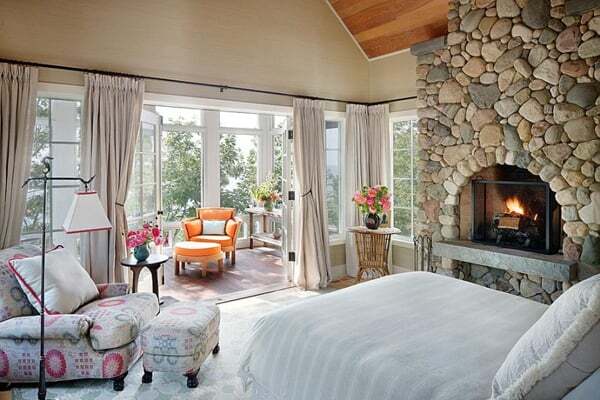 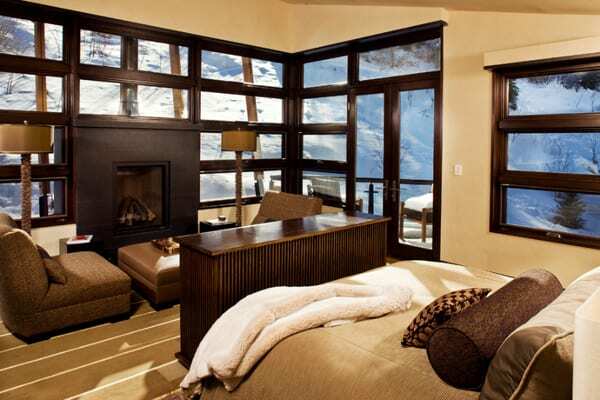 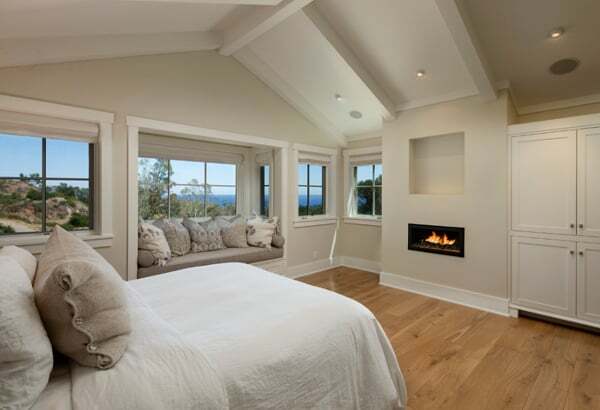 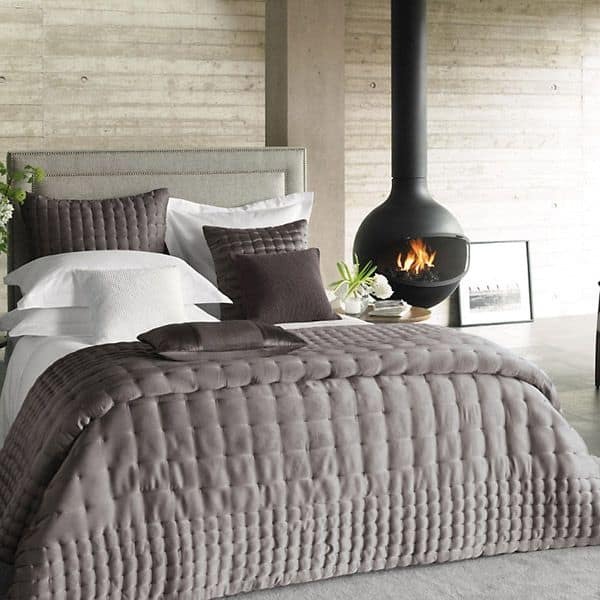 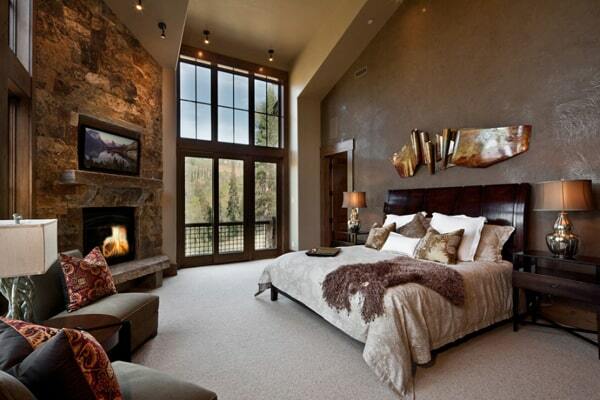 Have a look at these beautiful and functional master bedroom fireplaces for inspiration and don’t forget to let us know which one is your favorite! 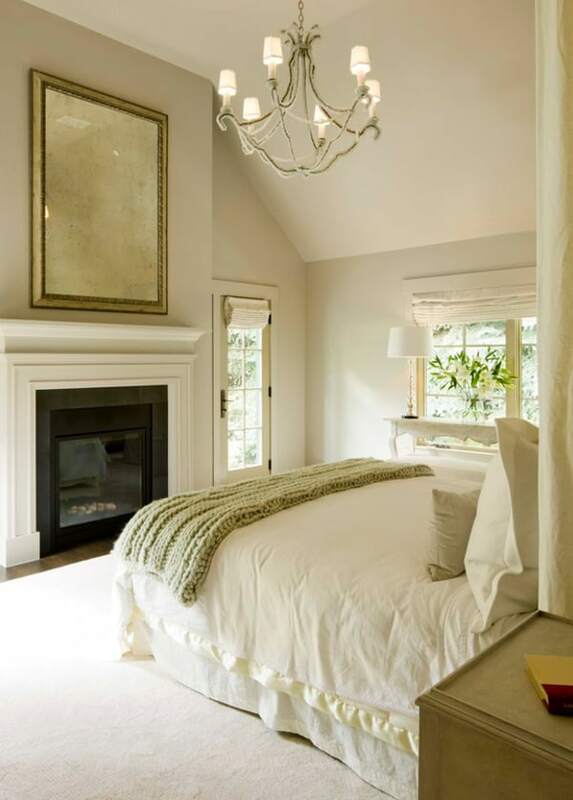 Design Tip: Place the recessed lights so they are clustered to highlight the a asymmetrical elements vs. a traditional grid. 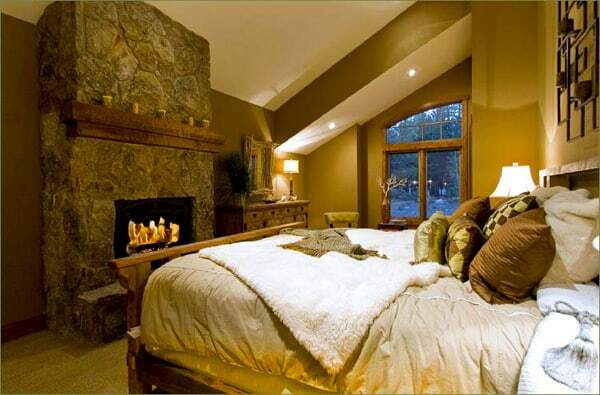 The fireplace shown here is delicately placed below a television of almost the same dimensions. 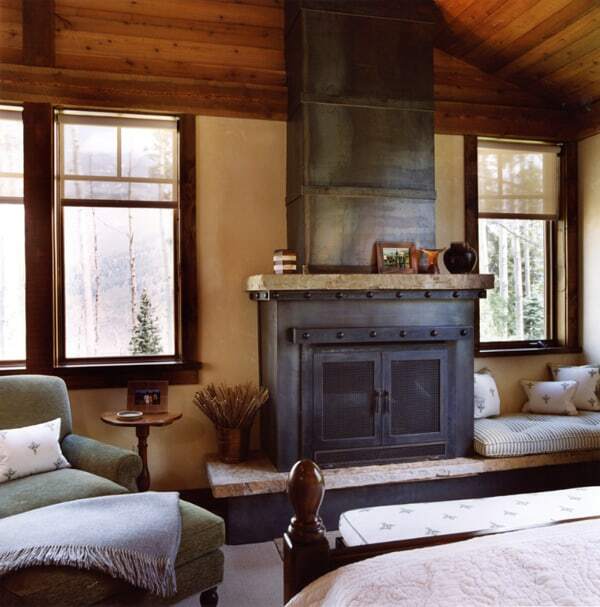 Offset shelves and a rustic mantel make it so unobtrusive, it almost could go entirely unnoticed. 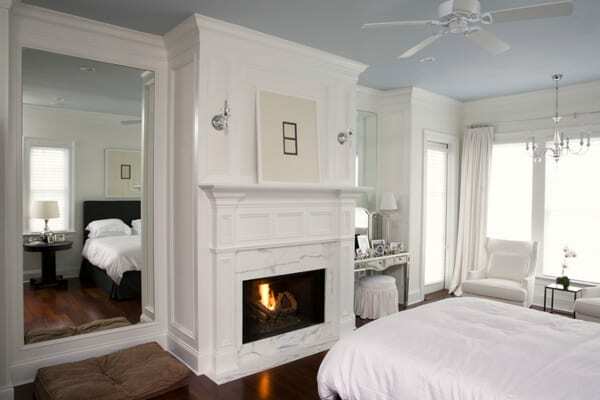 Design tip: Paint or tile the slight bump-out around the fireplace box if you want it to stand out more. 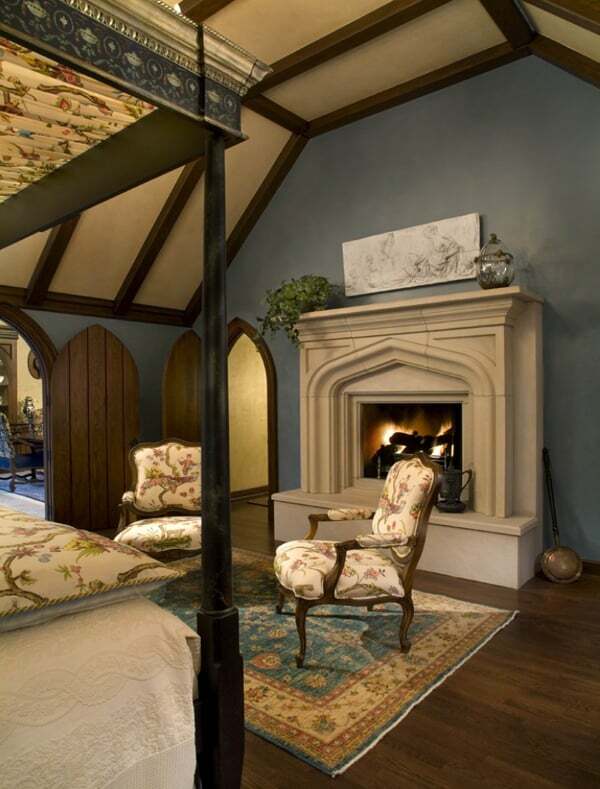 The fireplace surround is custom made- the interior border is by Walker Zanger, and the chocolate bar liner and chair rail molding used to finish the edges is from them as well. 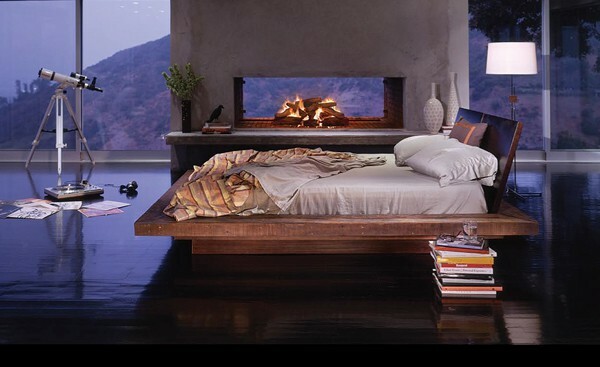 Create fully integrated design. 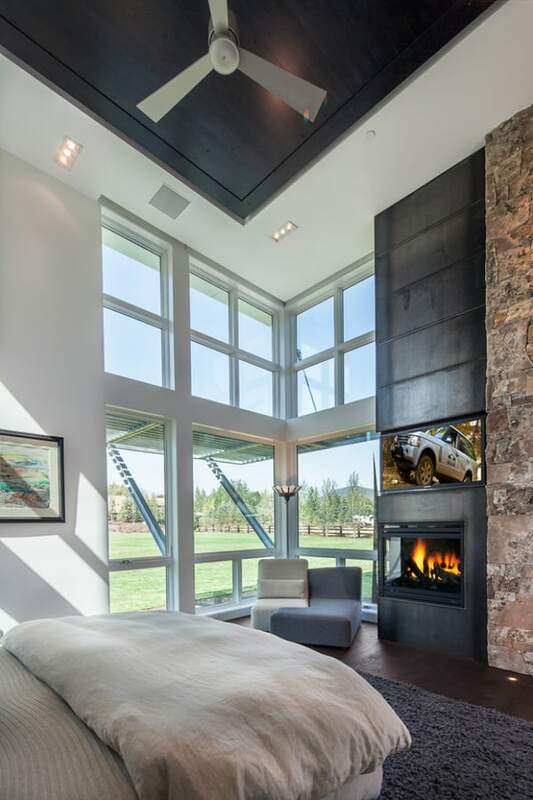 This low-lying fireplace gives way to a wall-mounted TV on paneling, which travels over and across the ceiling to a symmetrically placed bed. 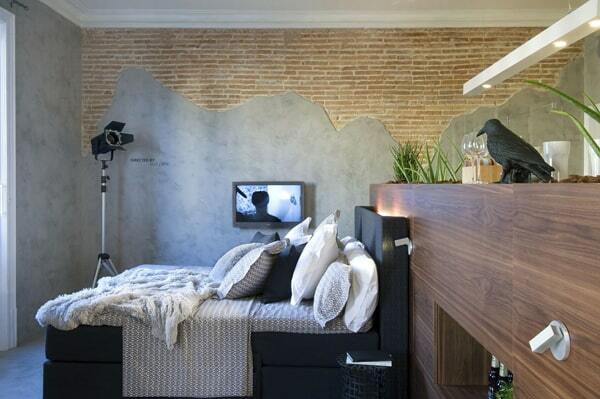 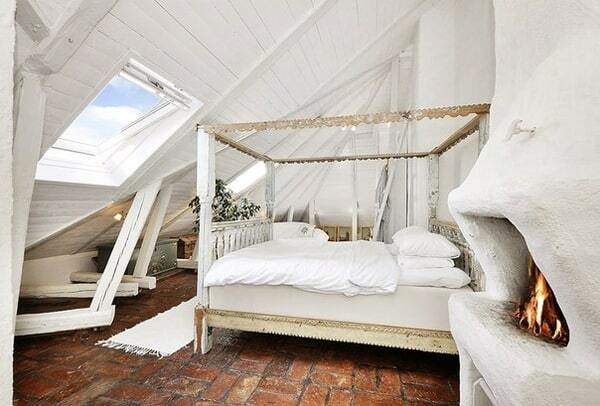 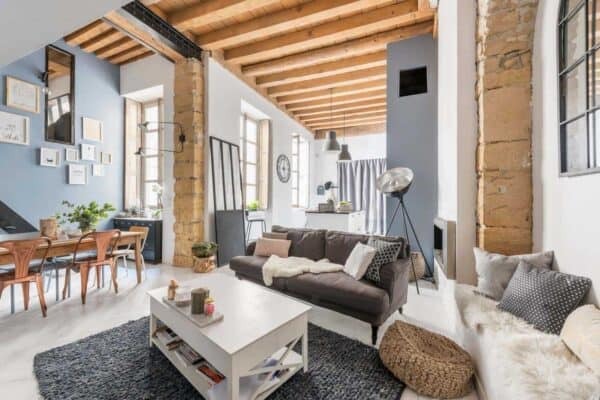 Everything in the room works together in this beautiful design. 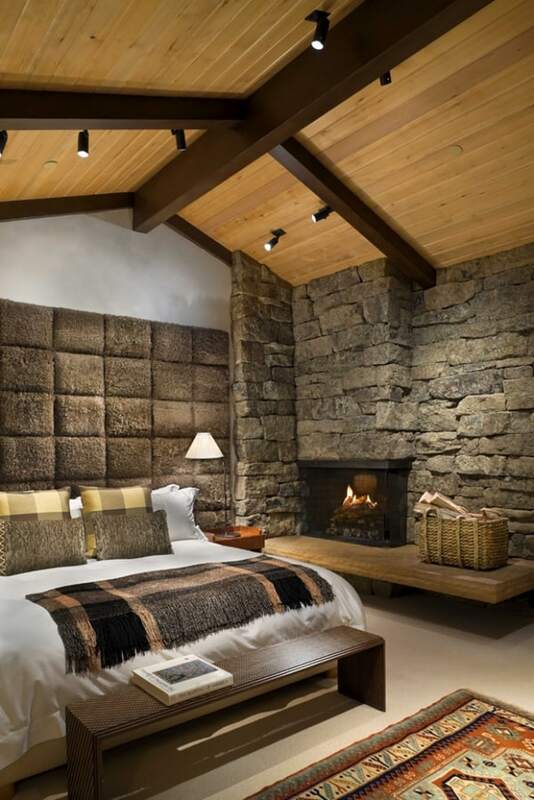 Design tip: Try mimicking the ceiling’s wood paneling on the floor using two different patterns and colors of carpet. 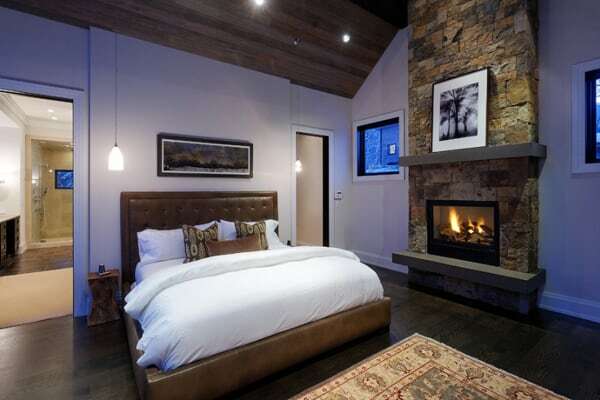 In a room full of windows, this strategically placed fireplace has the maximum effect, thanks to the all-black window casings and fireplace tile. 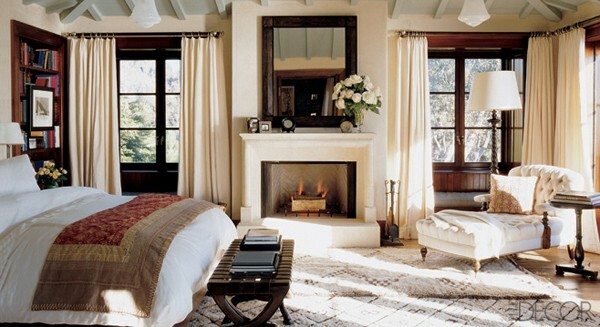 Design tip: A double-sided design in this room would turn the fireplace opening into another window. 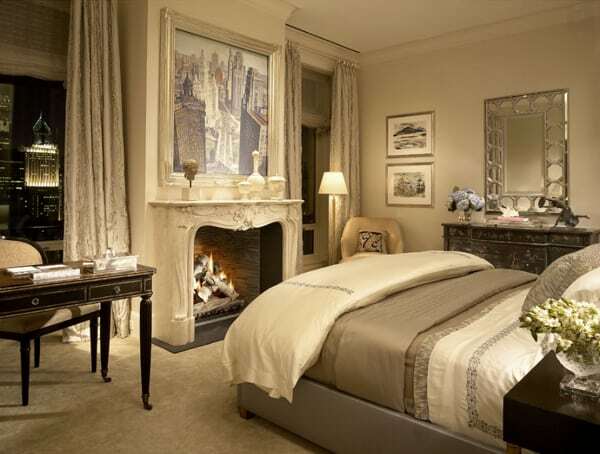 A chrome-trimmed fireplace adds to the upbeat, contemporary feel of this room and infuses it with a hint of glamour. 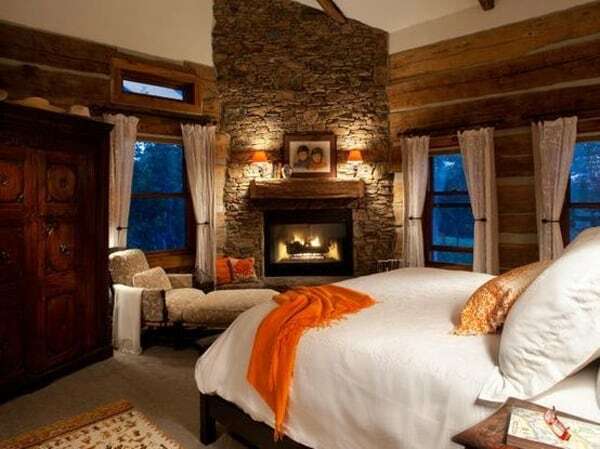 This rustic look is pitch-perfect for the cabin-style setting. 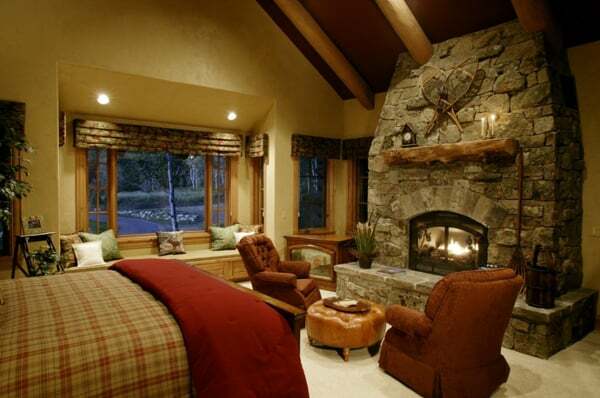 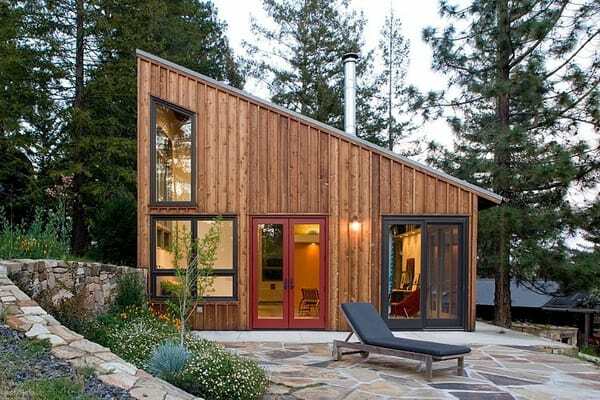 The window seat creates a cozy environment next to the fireplace. 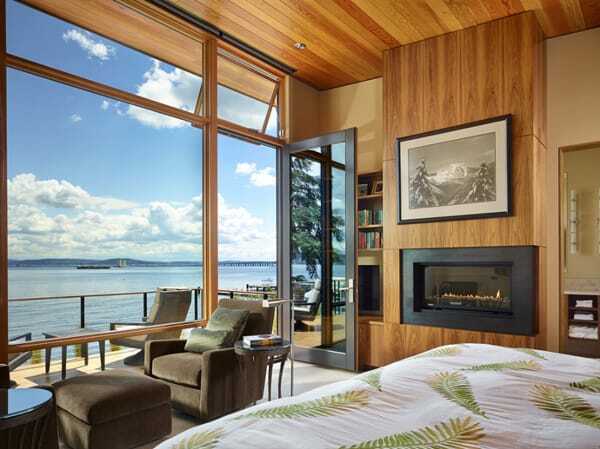 The fireplace doors have built-in mesh panels, eliminating the need for a screen.